Feel Nature ! Be Avtive ! Activity Over 350 animals are living in Bali Zoo. 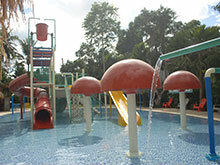 It locates in Sukawati before Ubud, and it takes 1 hour from southern resort area. In a normal zoo, you just watch animals, however, in Bali Zoo they offer activities such as Trekking around the zoo and rice terrace, Tree Walk, holding a baby crocodile, and taking pictures beside a big lion !! 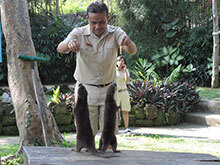 In Bali Zoo, you can touch animals, feel nature of Bali, and be active. ※Bali Zoo prices are changing by exchange rate every month. The price might different when you booking. Please notice that. Bali zoo transport adding airport area too! 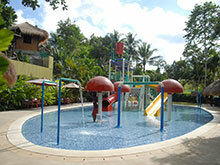 It is convenience for your first day & last day in Bali. If you do not have transport from hotel, you should booking with bali zoo for first day! Also you can join Balizoo adventure even for last day! The package includes lunch that you can choose in the restaurant. At the restaurant, Animal Touch & Photo Session is offered everyday from 1:00 pm & 4:00 pm, and you can take pictures with animals by your camera as many as you want! Please choose morning tour or afternoon tour. This special price is offering for guest who use Darna transport car charter. Fully fun day at Bali Zoo! 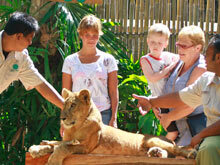 Package include short or long elephant ride, feeding, animal show that everybody can enjoy! Animals, especially, carnivorous animals like lion become active at night! Night zoo is different atmosphere than day-time. You can feel various animals’ indication and voices. After walking around the zoo with hand light, Please enjoy dinner at the restaurant with Animal Show or Fire show. * Transport Service from Canggu and Tanah Lot area need additional fee of Rp.150,000/car. 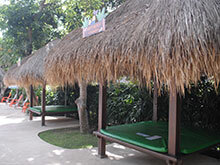 * Pick-up and Drop-off Service offers by Bali Zoo, and you might share one car with other customers. In addition, the car goes round to hotels in each area, so the pick-up time might be early or late. 1．Animal Show & Free Taking Pictures! 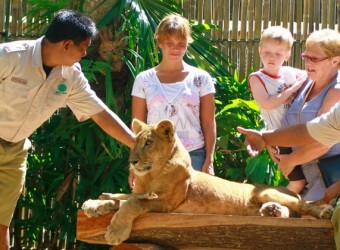 In Bali Zoo, they offer Animal Show & Photo Session 4 times in a day! On the outside stage in the zoo, you can watch Bird Show and take pictures with a beaver. At the restaurant show, you can touch crocodile and lion and take pictures as many as you want. Please bring your camera! Also, you can purchase the special Bali Zoo flame photo for Rp.40,000. 2．Only or Kids! Miniapolis Jungle! You can feed to orangutan, camel, and cute baby deer♪ For the package, it includes one plate for feeding herbivorous animals. 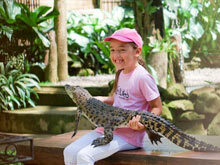 In addition, you can try feeding to lion and crocodile with additional fee.! For carnivorous animals, it’s safe to feed them using a long bar. Please apply at the zoo on the day. Ride on cute pony for 15 min. walk, and it’s cheap! Please apply at the zoo on the day.